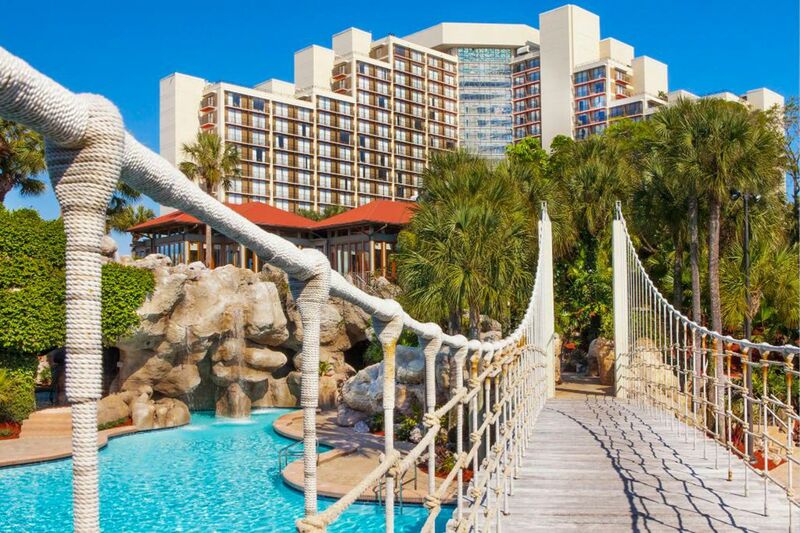 The only thing more important than choosing which Orlando theme parks to visit is choosing a hotel with a good — no, amazing — pool. We’re talking lazy rivers, zero-entry family pools, splash zones and more. 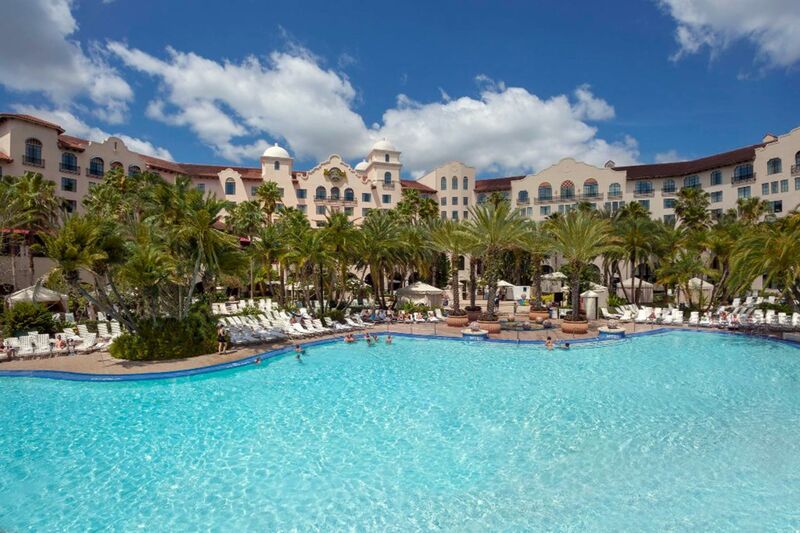 These are the best hotel pools in Orlando. 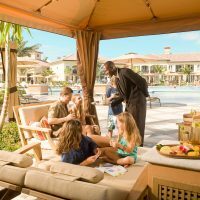 Luxury meets splash-happy fun at the pool complex at the Four Seasons Resort Orlando at Walt Disney World Resort. At the heart of the property is Explorer Island, a five-acre family water and recreation playground complete with a zero-entry family pool, multiple waterslides, a lazy river, an interactive splash zone and specially designed entertainment areas for kids and teens. Drifters lazy river features water cannons, a waterfall and bubbling rapids. Anchored by the towers of The Mansion, two thrilling 242-foot waterslides are aptly named The Drop and provide excitement, as well as variety. One slide is an enclosed flume, while the other is see-through fiberglass, so adventurers can pick and choose their fast-moving pleasure. An underground water sound system and signature Four Seasons poolside service pamper family members of all ages. At Marriott’s Harbour Lake, two pirate-themed water playgrounds are practically a theme park unto themselves for young children. Overlooking Lake Willis, Shipwreck Landing is an action-packed pool complex featuring a main pool with zero-entry on two sides, a pirate ship with slides and water cannons, two hot tubs and a turtle-themed kiddie pool. Daily games range from Family Bingo to Pool Relay Race and Beach Bag Scavenger Hunt. At a poolside hut, guests can get a hair wrap, hair braids, or else a temporary tattoo. 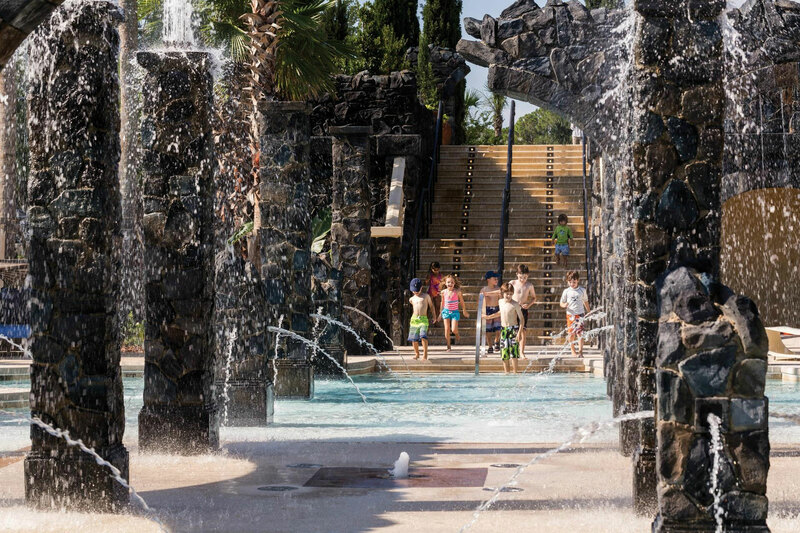 Nearby at Florida Falls, buccaneers big and small can face off in a family water cannon war, romp on an interactive splash pad, or swim in a zero-entry pool with a soaring slide (must be 42 inches tall to ride.) A round kiddie pool protected by sun sail shades will entertain the little ones. Take the plunge on a jaw-dropping 90-foot speed slide, watch your little ones play in a splash park, and then “light up the night” together at a poolside laser glow show-Orlando World Center Marriott Resort offers aquatic fun for everyone! Beyond easy access to Mickey’s, the World Center’s main draw for families is its tropical water play complex, featuring a zero-entry Kids Splash Zone with fountains, bubblers, water cannons and a mini-waterslide, and the Falls Pool Oasis, which lures more experienced swimmers with multiple waterfalls and slides. A new Icon slide tower features two 200-foot winding waterslides, as well as a speed slide-purported to be among the tallest and fastest in Florida! A major 2017 resort expansion brought a new wave pool (the only resort wave pool in Orlando! 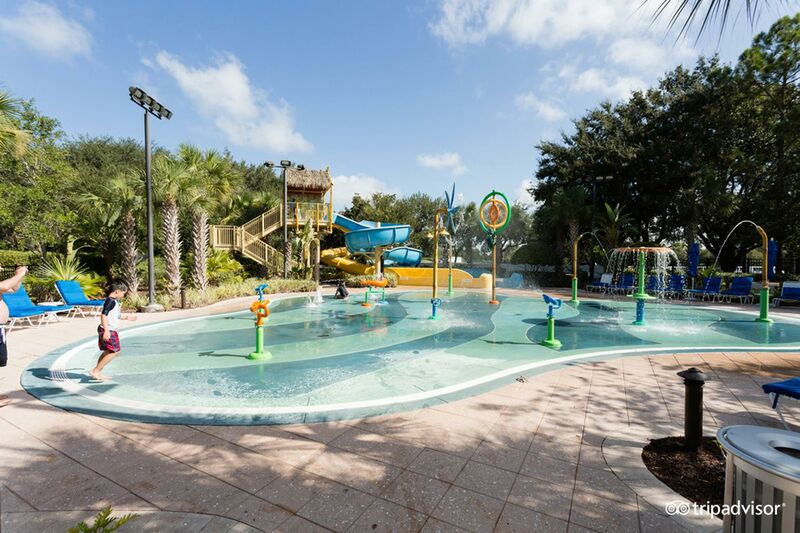 ), a new children’s water play area and a lot more elbow room to the already awesome water recreation complex at this Kissimmee area luxury resort. Kids can grab an inner tube and float along the 850-foot lazy river, which features a waterfall, sprayers and shooting water cannons. Nearby, at the adjacent zero-entry family pool, families can race down a 125-foot waterslide and cool off under “dancing” fountains and a 30-foot spilling water tower. A new kids’ pool features 23,000 gallons of liquid cool, with three pint-sized waterslides, zero-entry and plenty of room to splash and play. 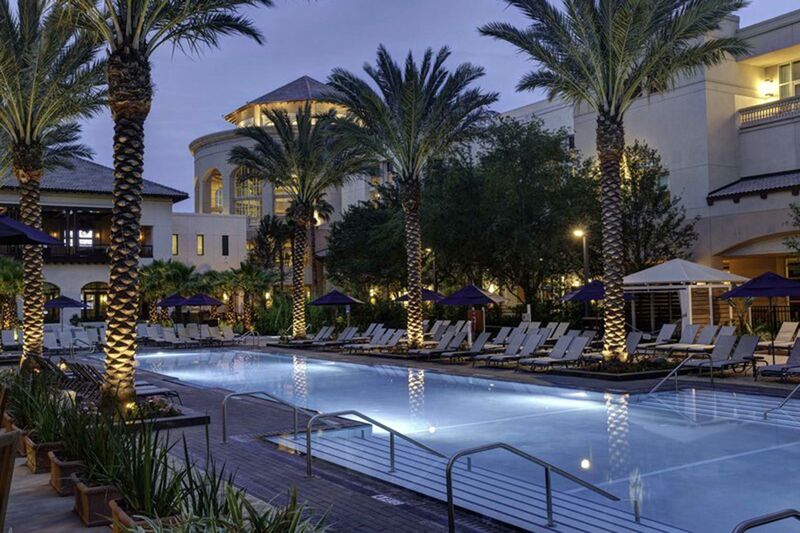 Fifteen of the Omni Orlando Resort‘s private cabanas are conveniently situated near the family play areas. Surfs up at Cypress Springs Water Park at Gaylord Palms Resort, located less than 10 minutes from Walt Disney World Resort. At the family-friendly aquatic playground, guests can catch a wave on a double surf simulator, race down seven winding waterslides, or splash into a zero-entry swimming pool. Three new waterslides were added in 2017, including Tamiami Twister-a pair of high-speed dual-racing tornado flumes, and The Florida Free Fall-the tallest AquaDrop slide in the state of Florida. The Tree House water play area, designed for young children, features sprayers, a dump bucket, toddler swings and mini-flumes. Cabanas, plentiful lounge chairs, two hot tubs and a Sand Bar offer rest time and refreshments for adults. An expansive resort-style pool complex at the Renaissance Orlando Resort at SeaWorld stars R Aqua Zone, one of the most entertaining water play areas in Orlando. In addition to periscope guns, a water windmill, and a gyroscope spinner, the interactive water playground offers multiple waterslides, shooting water jets, a rain tree, and a dedicated area for ‘tweens and teens, as well as toddlers. The lushly landscaped resort-style pool features multiple hot tubs, poolside dining and luxurious loungers, many in a private cabana setting. Nearby, guests will find Ping-Pong tables and a kiosk featuring hair wraps, braids and temporary tattoos. On select nights, dive-in movies are offered. 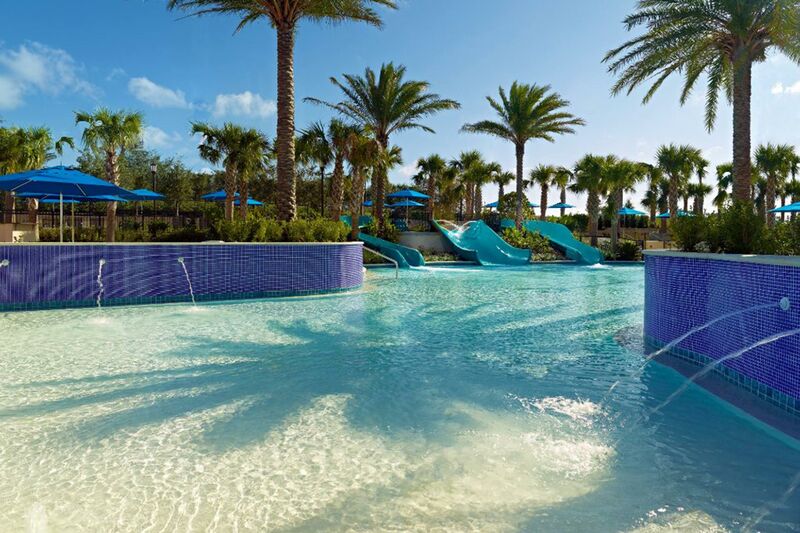 One of the best water play areas for families in Orlando, the JW Marriott Orlando, Grande Lakes pool complex includes a partially shaded, meandering 24,000-square-foot heated lazy-river with cascading waterfalls, a zero-entry area that’s great for preschoolers and five connecting lagoon pools. Activities staff are on hand to entertain and surprise kids with fun diversions like popsicles and water toys, and at a poolside kiosk, you can get a souvenir braid or hair wrap. Lounge chairs and pool towels are plentiful, and lifeguards are on duty. A partially shaded, circular kiddie pool features shallow waters and an entertaining alligator mascot. 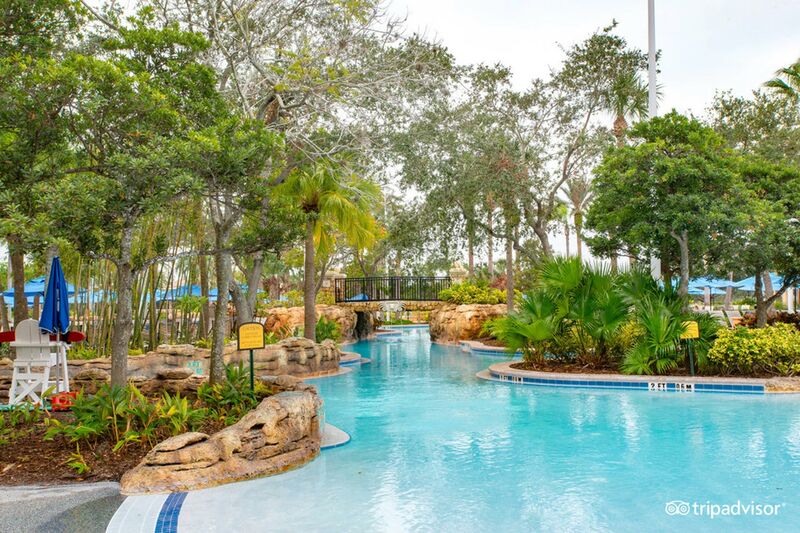 Overlooking a private 10-acre lake and less than five minutes from the Walt Disney World theme parks, Wyndham Grand Orlando Resort Bonnet Creek offers a wealth of family-friendly water play amenities. 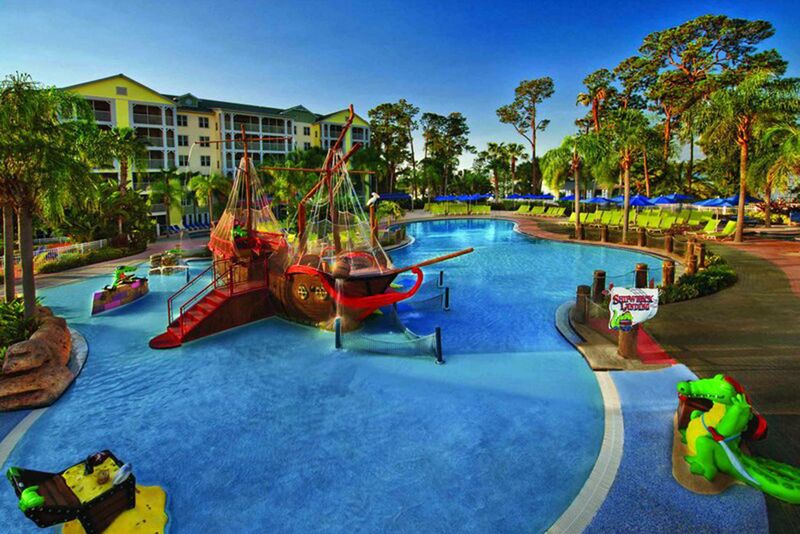 Highlights for the kids include a zero-entry lagoon style pool with a pirate ship, slide and a splash zone. Parents will appreciate poolside dining, cabanas, concierge services and lifeguards. A major perk for guests is complimentary use of facilities at the Wyndham Bonnet Creek Resort (a timeshare property) next door, including five pools, two lazy rivers, two kids’ splash parks and nine hot tubs. 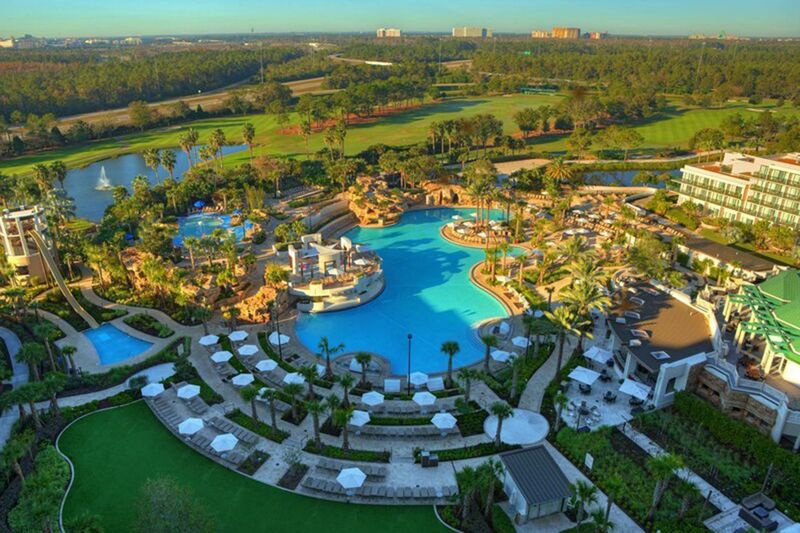 A perennial favorite among families, the half-acre, 800,000-gallon heated lagoon-style pool at Hyatt Grand Cypress Resort Orlando is a refreshing escape from the theme parks. The beautifully landscaped complex features 12 waterfalls, a waterslide tower pavilion, a water jet splash zone and lots of options for lounging. Boasting 12,000 square-feet of rockin’ relaxation, the enormous pool at Hard Rock Hotel at Universal Orlando Resort will put a tune in your ears and a swagger in your swim stroke. The zero-entry main pool features underwater music, as well as a sandy beach and a winding 260-foot waterslide. Interactive fountains and organized daily activities, from water balloon games to dive-in movies, will keep the kids occupied. For the ultimate “rock star” experience, rent a cabana, complete with a ceiling fan, a fridge, a plasma TV and beverage service. Enjoy a “daycation” at the beach, without the need to leave Orlando, at Universal’s Cabana Bay Beach Resort. Just steps from Universal’s Volcano Bay water park, the colorful aquatic complex at the retro beach-themed resort features a zero-entry Cabana Pool with a vintage dive tower and a winding waterslide, a lazy river with waterfalls, a sandy beach and an interactive play area for younger children. You can have a pizza delivered to your private cabana (rental fee), play classic lawn and beach games, and end the day with a dive-in movie and a round of fruit smoothies from the poolside bar.